This page is under contruction at the time. There are more photos of my materials and descriptions to come. Thanks for your patience. Clicking on the images will take you to a larger image. The room that I do all of my painting is a small spare bedroom that I converted to a studio. It measures only about 8' x 10' but it's plenty big and suits me fine. Below is a list of materials that I use and short descriptions. This is my easel that I built myself and it serves me well. The panel that supports the painting has holes drilled every 4 inches vertically and horizontally to acommodate dowels that can be moved around to support any size painting. This panel can also be tilted and raised up, or lowered. 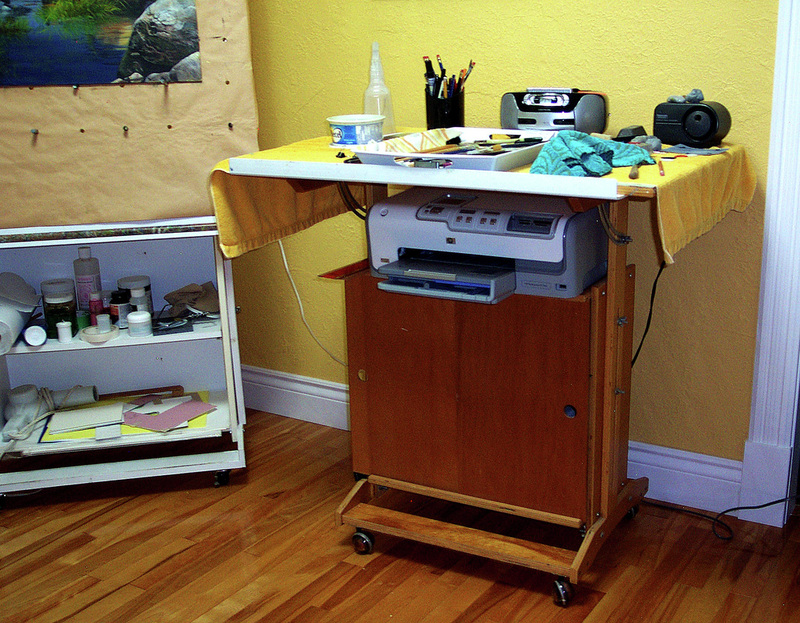 This allows me to move the painting up or down, side to side depending on whether I'm painting standing up or sitting down. I prefer painting standing because it gives me the freedom to walk back and forth to view the painting from a distance. The whole unit is also on casters. The stick you see hanging on the left of the board is my malhstick that I use to steady my painting hand when painting small detailed areas. 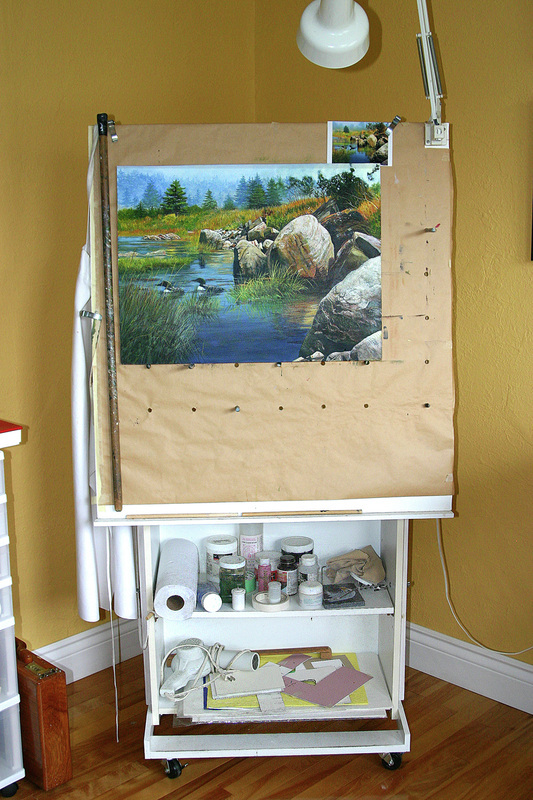 This is my drawing table which I also use to lay my paints and brushes on while I'm painting. This unit is also on casters which can be freely moved around if need be. 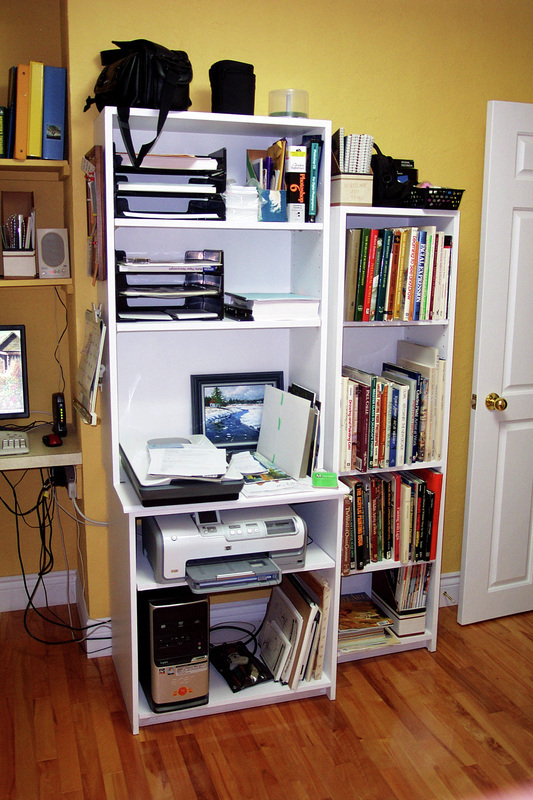 My computer cabinet which houses my modem, scanner, printer and different papers. To the right is my bookcase filled with books that I've collected and received as gifts over the years of well known artists that I admire very much such as Bateman, Danby, Isaac, Calle just to name a few. 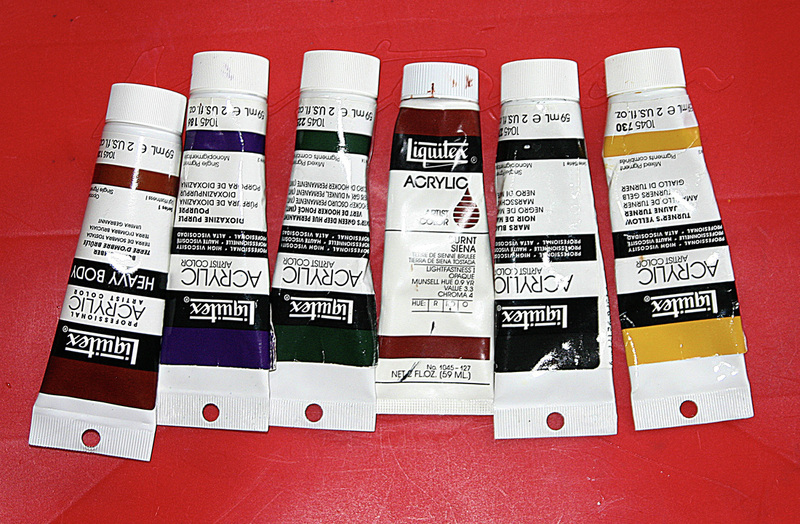 Liquitex acrylic paints is what I use exclusively in my paintings. Ninety percent of the colours I use are: Titanium White, Ultramarine Blue, Cadium Red , Cadium Yellow Dark, Yellow Ochre, Burnt Sienna, Burnt Umber, Paynes Grey, Pthalo Blue, and for my greens I prefer mixing using Pthalo Blue and any of my Yellows. I prefer painting on 1/4" masonite board with 3 or 4 coats of acrylic gesso. After the painting is complete I coat it several times using acrylic gloss medium mixed 50/50 with water.